Dear friends! We would like to give you all an update on where we now are and where we are going tomorrow. Very exciting and dynamic times for us. We made great progress in terms of platform development and today we proudly present the beta-version of The Abyss Minimum Viable Product (MVP). The MVP is a very powerful vision for our future and the future of the entire gaming industry and digital distribution. It is clearly designed, adaptive, user-friendly and… already launched after a year of continuous effort and hard work! You can start your own The Abyss experience by clicking this link. We should stress that the goal of The Abyss is to apply and develop best practices in terms of technology and user experience. And we are making mindblowing progress in all these aspects. The Abyss is an amazing digital platform with features that will transform the market and drive our joint success. Let’s do the tour over the MVP to show you some tips and details we have implemented. Music Wars, a browser-based MMORPG where the players have to defend their musical preferences in a series of fierce struggles. The game has vivid graphics, an exciting plot and a unique combat system which have already attracted 8+ millions of gamers worldwide. Lords of Arena, another browser MMORPG where gamers can assemble a band of the finest warriors, teach them the art of combat, and go crush the numerous enemies. The game offers two options: either an exciting campaign or a death fight with other players in PvP mode. W.O.R.L.D.S. is an amazing free-to-play MMO game where players can create their own civilizations and lead them from ancient times to the space era. The game is known for its creative gameplay with city-builder simulator and strategy elements. And this is just the beginning. The first client games we have reported previously are on their way and coming soon. The Abyss user interface has been changed significantly compared to the recent version and is almost close to perfection. It has become smoother, more intuitive and user-oriented. Try and enjoy it yourself. The greatest change to the platform so far is an adaptive design. We are striving to build the platform which looks convenient and extremely fine on every supportable device. We have introduced numerous improvements to the previous version to make this happen. The soon-to-be-added features were removed which made The Abyss platform cleaner and enabling quicker navigation. With lots of fascinating animated elements added, the platform became easier to explore. Allowing to launch and play games with several clicks. Based on these principles we’ve designed the screens, modal windows, and tested the visual prototypes that proved good, therefore helping to speed up the creation of The Abyss user interface. The MVP has a unique, recognizable and accurate style, and even more improvements would emerge in the course of further user interface evolution. The UI can be scaled to meet the platform’s needs. The hottest games are located in the side menu, and users can access them in one click. There is a rubricator in the left top corner of the screen, which helps to sort games by their type (browser, client or free-to-play). The authorization and language selection buttons are also implemented in the left-bottom side menu which is the result of an in-depth study of user behaviour patterns, and competitor analysis that we have carried out. The Game page contains the game’s features and system requirements on the right side. Screenshots, videos and game description can also be found here. The Abyss MVP already represents a set of unique and state-of-the-art technologies that will undergo further development. The server side of The Abyss platform is based on a geo-distributed microservice architecture with a Domain approach to application data organisation. The interaction with RabbitMQ-based AMQP protocol is implemented through the Potato framework developed by The Abyss all-star development team. This framework, which is our own in-house solution and intellectual property, provides a guaranteed transfer of events between geographically divided data centers, even in case of temporary loss of nodes connection within a distributed system. While running synthetic tests on an AWS instance of the m4.4xlarge type, a peak value of 24 thousand messages per second was achieved with 100% deliverability and the average number of repetitions was 1 per 8 thousand. The system data is stored in Cloud-database instances, divided into shards. The sharding method depends on data type: this is either horizontal sharding by the geography or vertical sharding within each individual domain. The selected PostgreSQL solution has a storage with dedicated I/O resources. Each shard can have associated resources up to 16 TB of storage and up to 40,000 IOPS. Finally, we have implemented an integrated billing system that allows to add ABYSS tokens to your balance (withdraw functionality will be available in a few days). The Abyss Payments System allows for purchases with various currencies. We have designed the funds flow algorithm, considering most of scenarios for cash flow and distribution between the platform and the developers. The international double-entry book-keeping method (meant for incoming/outcoming transactions) has also been introduced. The Abyss MVP is far more than it seems to be. It has enough core set of features to effectively develop the platform in future. We have divided the existing features by section. The MVP is a part of our strategy and process directed toward building the best gaming platform of its class. The MVP launch is a major milestone for our joint project, and we’re proud of delivering it on time. It is an important step on our way to bringing all the advantages of blockchain to the global gaming industry with its multi-million audience. 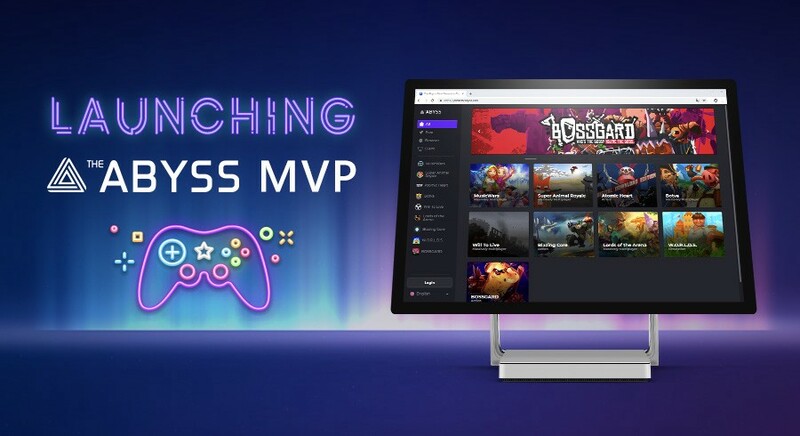 The Abyss adopts an innovative Platform-as-a-Service (PaaS) model allowing our users to easily develop, run, and manage game projects with no third parties involved, and providing a comprehensive infrastructure with built-in services and solutions for gamers. The team is now setting course for expanding the functionality and adding new games and features. No matter the status of the crypto market or lack of funding, The Abyss project undergoes continuous development. Every day we make a few more big steps in the right direction. Many great things are in the pipeline and we will share them in the near future. Stay tuned for great news on our future!